Nah’then! It’s a great honour for me to have fellow blogger Jan AKA. Denimetc answering some personal questions for the Heritage Standard blog. Jan was one of the first people I followed way back and he’s a particularly interesting and knowledgeable fellow to follow. This mans blood is blue but he also appreciates all things quality, leather, and vintage style. Having followed not only his Instagram account @denimetc but also his blog denim etc. I’ve picked a fair bit of info off him here and there and he’s always ready to pass on knowledge or help with advice. He has a great sense of mixing different brands together and making them look fresh, compatible and always classically rugged. How did this start, what are your first experiences with style, particularly denim and workwear? I have as long as I can remember been interested in clothing and style. 1950’s look was very much in style when I was growing up in the 70’s and I got my share of that. I think that the aesthetics of 50’s has somehow always stayed with me although there has been many other influences along the way – Classic British menswear being one of the most important one. 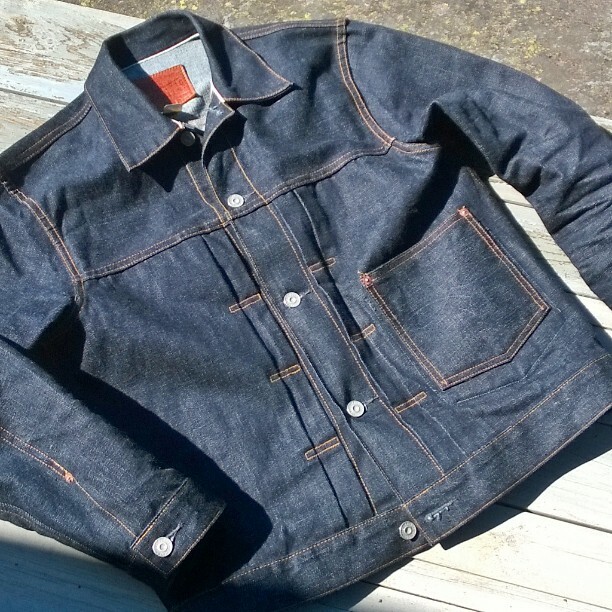 First denim brand I remember as a child was Wrangler, so I have always had a special connection to that brand and my love of denim was revived when about ten years ago I found a Japanese made reproduction of 1947 model 11MJ denim jacket. I was not looking for a denim jacket at all but when I saw it I knew that I had found something important. It was made of selvage denim with a yellow id and that was such a revelation for me. I immediately knew that I had somehow known it existed but I had overlooked it for many decades. I started studying everything I could find online on denim made in narrow looms and also read quite a few books on the subject. Along with that research I discovered that there is actually a whole subculture around denim and workwear. When did you decide to get into blogging and social media and how has it evolved for you? My interest in Social Media came relatively late, I first started with Twitter around 2011 and mostly just followed people I found interesting. When I started searching for Information on Denim online I ran into different sites and blogs that really helped me to get more depth into my passion of denim. Pretty soon I realised that I was spending a lot of time thinking about my own blog so I decided that I might as well start one. It has always been bit of a private affair, I never tried to make it a “Denim news” kind of blog but rather a place to write about item’s that I see somewhere or have myself and enjoy. Pictures have also played an important role in the Blog – sometimes there’s very little text in my posts. After the Blog came Instagram around 2012 and in a way that has taken a lot of attention away from writing the Blog – unfortunately. But through Instagram it has been easy to connect with likeminded people. Although I get a lot of hits in the blog there are very few people who actually make comments. However, with Instagram the commenting is easy and more common. 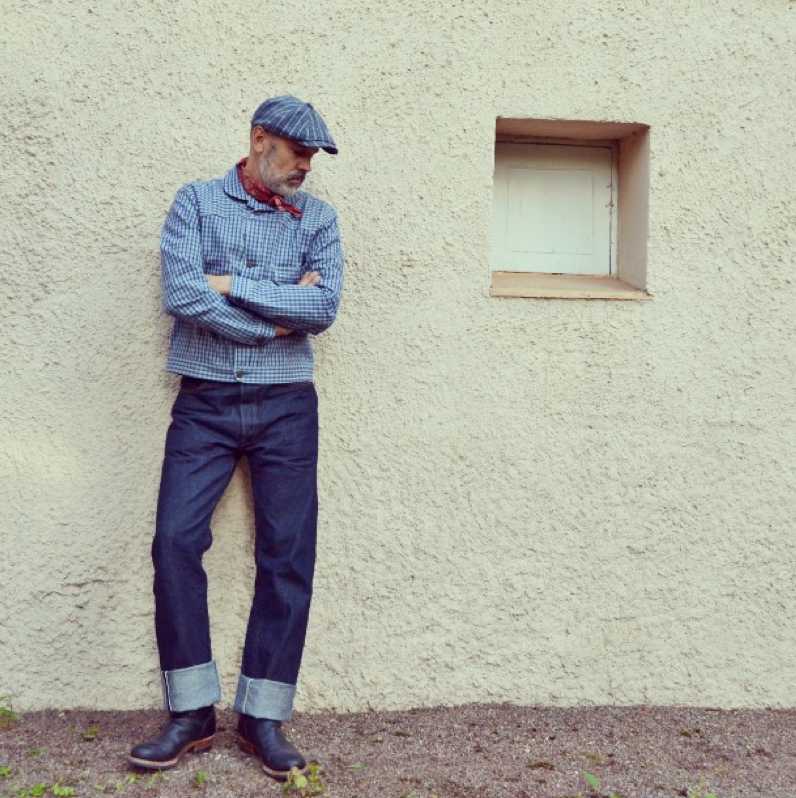 What is it that you find particularly appealing about denim? It’s the tradition and versatility of denim. As of tradition, I am not specifically looking for a vintage denim pieces but I like new products that have been well reproduced from vintage models or brands that just take inspiration and details from the past and translate them to a more current fits – like RRL for example. Denim is also so versatile, you can wear denim in almost all kinds of occasions today. I do value quality and craftsmanship in the stuff I get and have recently tried to limit my collection to only handful of core items. I have never been a “one Jean man” that wears a pair from raw to retirement. I have respect for people who do that but I prefer changing it daily. Having said that, I recently signed up for a one year contest organised by Denimbro forum. We group-buy Freewheelers 601XX 1951 model (Vanishing West) Jeans and the idea is to wear them non-stop for one year. I am interested to see how long I have patience and stamina to do it. I like nicely faded jeans just as much as any other denimhead but I am not obsessed in fading. They come if they come but I enjoy dark blue just as well. Another Denim genre that I don’t sign up to is never washing. I don’t wash often – mainly, because I don’t really expose my jeans to a very gruesome environment but nevertheless, when needed, I wash. Also, I give a warm rinse in the bath tub to all the new rigid denim I buy before wearing them. Something I always wonder with fellow denimheads. What do you enjoy wearing during summer to retain your image as a workwear fanatic? Does it change much from year to year? I still wear a lot of denim in the summer but I do change into a lighter weight denim and to older more worn and washed jeans. I seldom buy pre distressed denim but earlier this spring I found a very inexpensive pair of LVC 1944 501’s in a rather well faded wash. I ended up wearing those for most of the summer. 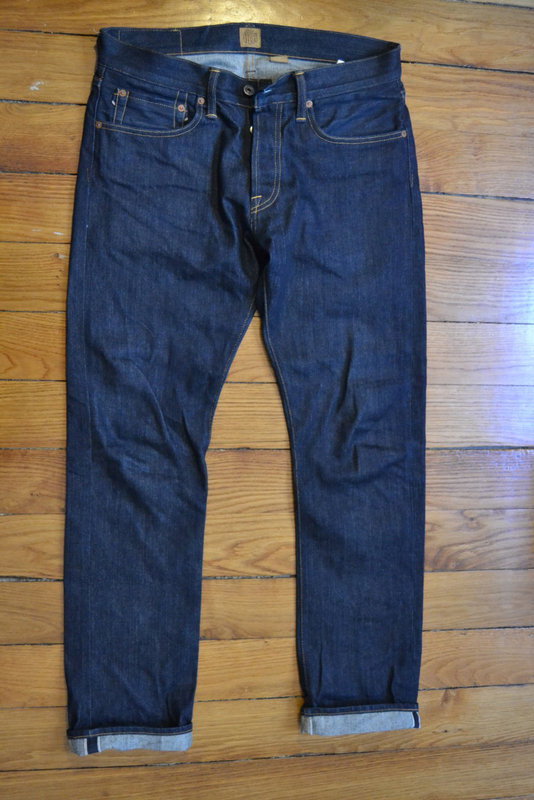 I also have a pair of really heavy wash LVC 201’s that were made in Levis’ Valencia Street factory back in 2000. Those are really loose fit and comfortable summer jeans. But a good pair of Chino style shorts that are just above knee length and maybe with a cinchback work really well for me. Those can be worn with boots for more workwear look or with chucks or vans for a more summer look. What are your 3 favourite items to wear and 3 favourite things you’ve found? 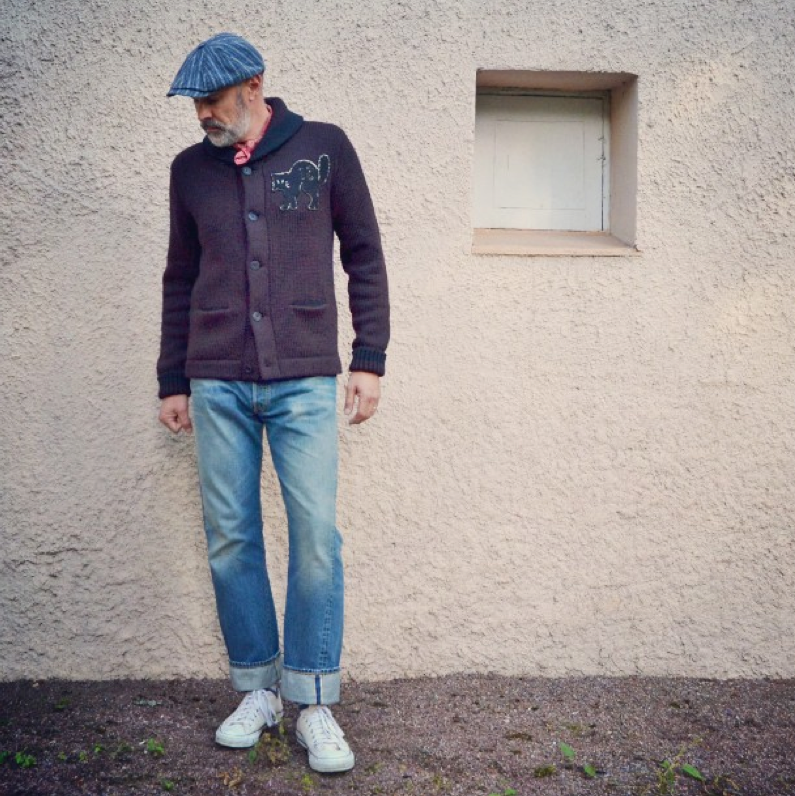 RRL 1927 Type 1 jacket. This is from a rather recent collection. It’s a really well fitting Type 1 with a more contemporary fit. In other words it’s not as boxy on the torso as the originals and the sleeves are bit slimmer and longer. The denim is what RRL calls “East-West Denim” It’s a Tennessee grown cotton that has been milled in Japan and finally the jacket is made in USA. Maybe not the most Carbon-Free product but a wonderful jacket nevertheless! Indigofera Ray Jeans. 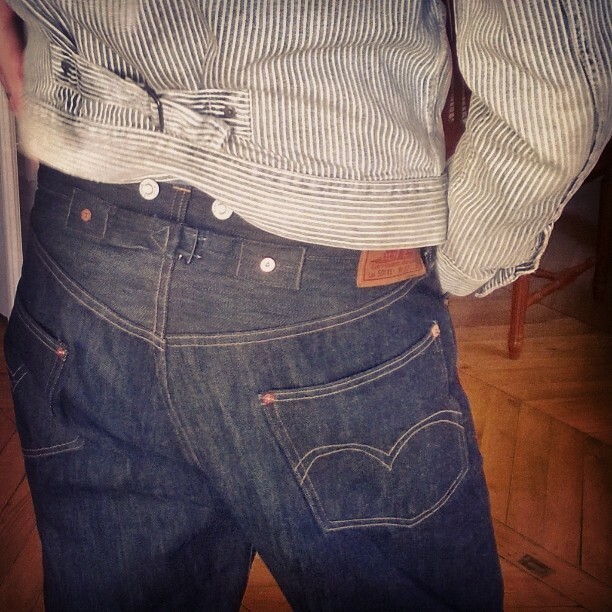 These are from one of the first collections of Indigofera Jeans from around 2009. 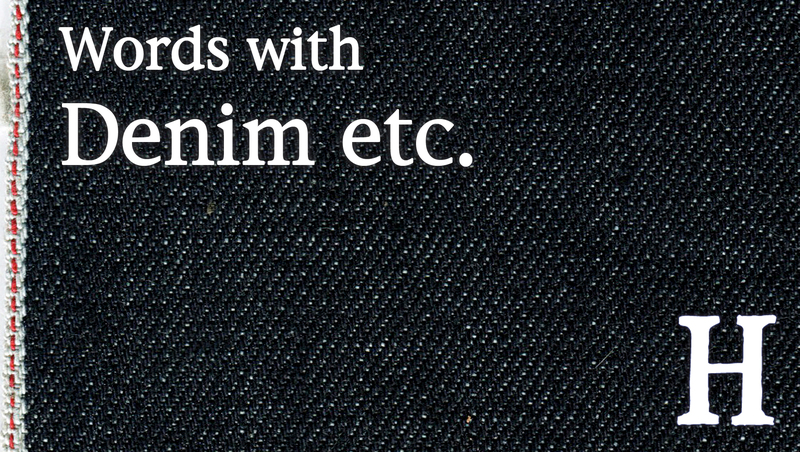 Fabric is a really nice Italian made Selvage denim. When I have to choose one pair only for a trip for example, I often go for these. Indigofera Jeans is a brand I have lot of respect for. They have a very tight collection and the quality id very good. Many models in their collection have stayed the same from year to year – only fabrics change and evolve. Most of their fabrics come from the best mills in Japan. LVC 1922 501’s. My favourite model of the pre-war 501’s. It’s wide as expected, but not terribly so. Buckle is still there and it’s the first model with belt loops. I find myself wearing these more and more and after about two years of wear and couple of washes they have become very comfortable. This is a good example of getting the waist size right. Although I love belts, I can wear these well without a belt and that probably is one reason why they feel so good. What item of clothing means the most to you and why? Maybe it’s the above mentioned 11MJ Jacket because it really made me discover and appreciate premium denim. Another one could be my Loake brown suede Brogues that used to belong to my father. I also have a pair of my own early 1980’s 501’s that have been worn from rigid to threads and now only thing that is left is cutoffs that my wife’s wearing in the summer. What role do you think denim and in particular jeans play in todays world? Denim is everywhere and it evolves in so many different directions today. There’s so much different Denim around – most of it quite appalling stuff in my opinion. If you sit down on a street café or park and watch people pass by, maybe 7 out of 10 people wear Jeans. But I’ll have to sit and wait for a very long time to see something that I find interesting. However, at the same time, I realise that the segment that I am interested is only a tiny portion of all the denim out there. So, I don’t want to judge, because I know that for most people out there a 1920’s cut 501’s are just as odd as Skinny fit destroyed stretch jeans are for me. What advice would you give to someone starting out who was looking for some key pieces or had to work with a tight budget? Get less stuff but try to buy quality. 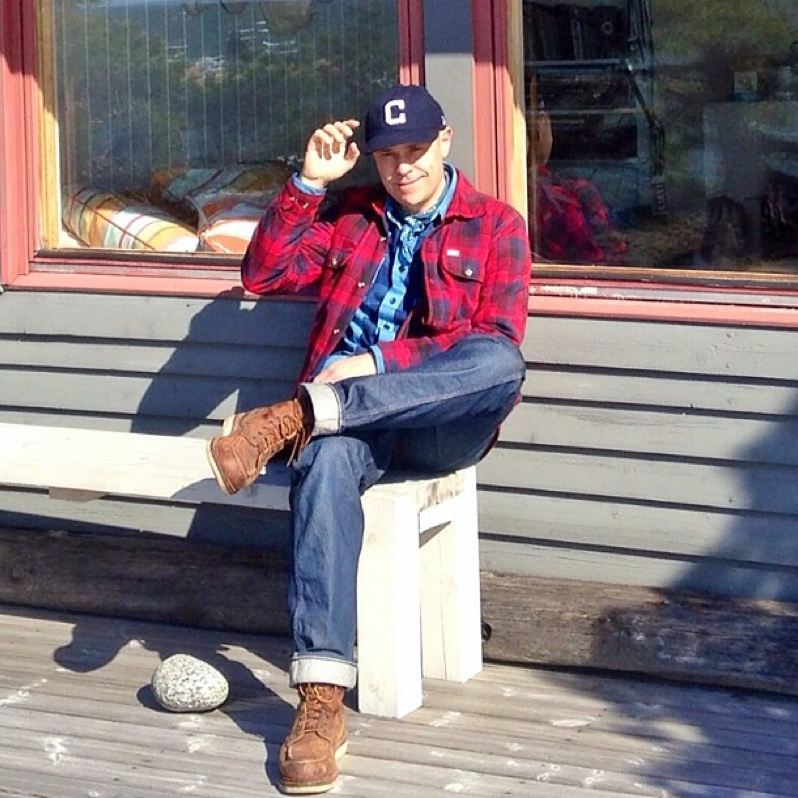 When I first got the Denim buzz I was buying a lot of stuff, as long as it had selvage. But on hindsight there were more misses than hits. So I’ve got rid of most of it. The fit is the most important thing, therefore I try to buy more from shops where I can actually try the items on and see that they truly fit me. If the sizing or fit is not right, you will not wear the item no matter how prestigious brand it is. 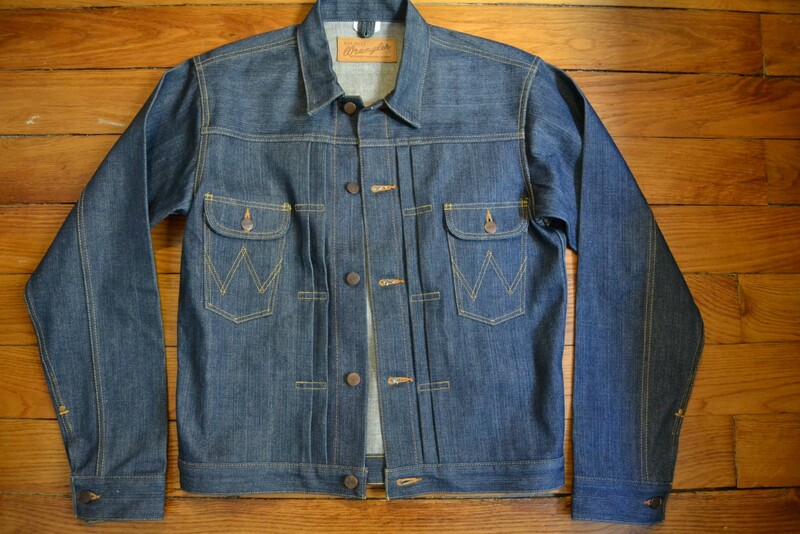 If I would start over I would get one good pair of 1947 reproduction jeans from some Japanese repro brand such as Warehouse & Co, 1930’s Lee 101 Cowboy jacket, nice reproduction Chore Coat (Indigofera Kirk or something from RRL) and one rigid denim shirt (LVC sawtooth or Wrangler 27MW) and one good quality Chambray workshirt. Those mixed with pair of boots, sneakers and couple of bandanas and you’re set for a long time. Lastly, how do you like your eggs? “Devilled Eggs”, a starter in Restaurant Mary Celeste in Paris – a real treat! I am not a morning egg eater, but if I do I make a big hole in the middle of the toast and fry an egg on top of it flipping it over. Eat it like a bread with some crispy bacon preferably. Many thanks to Jan for taking the time to put this together.